Aggressive Sell, Soft Sell … What Works? Recently, a student of ours asked whether “we” (content-based marketers who might prefer a more subtle approach) can learn anything from “those” marketers who use somewhat obvious tactics like silly quizzes or hyped-up headlines. “Black hat” and “white hat” are, of course, terms that some marketing and SEO professionals use to indicate how willing they are to bend rules. For me, it’s not “black hat” unless you’re lying to your audience, in which case don’t try to tell me what a cute, little gangster you are. It’s illegal and it’s wrong, so go away. But orange hat … that one is a little more complicated. In my made-up definition, an “orange hat” marketer is one who’s exceptionally comfortable with cheese. Well, we know it when we see it. It’s a pushy headline that Claude Hopkins himself would have found a little old-fashioned. If a “salesy” approach works for you, and you’re not lying to your audience (or yourself), keep doing it. I don’t think it’s immoral or wrong to use cheesy sales and marketing techniques. I just don’t happen to believe that “it works” all that well for most audiences today. But if your tests are demonstrating otherwise for you, more power to you. Human nature doesn’t change very fast, or very often. We’re more or less working with the same brains as our Paleolithic ancestors. Maybe a little less hangry, since we have carbs now. But human communication style changes all the time. Words go in and out of favor. One culture loves an ornate, embroidered writing style — another culture scorns it. And in a diverse culture like ours, one person’s chuckle is another person’s cheese. Maybe I’d see a piece of content and call it silly, clumsy, or annoying. Another person would see the same content and find it funny, entertaining, or convincing. That’s why pretty much everything we’re teaching these days starts with our favorite three-letter word: Who. Who are you talking to? Who’s your perfect customer? Who is this complicated human individual you’re trying to reach? If your Who loves cheesy quizzes, give them some really gooey ones. Find out which Hogwarts dinner entrée they are, and embrace it. Don’t be cynical about it. Find a writer who can revel in it and genuinely have fun. If your customer likes cheese, give them great cheese. Really? Your audience is so sophisticated that they won’t answer questions so you can address their concerns in a more relevant way? They are, perhaps, a Star Trek futuristic alien race who can telepathically transmit their needs and concerns directly to your brain? Don’t dismiss quizzes, or story-based content, or any other tactic because you think it’s inherently cheesy. 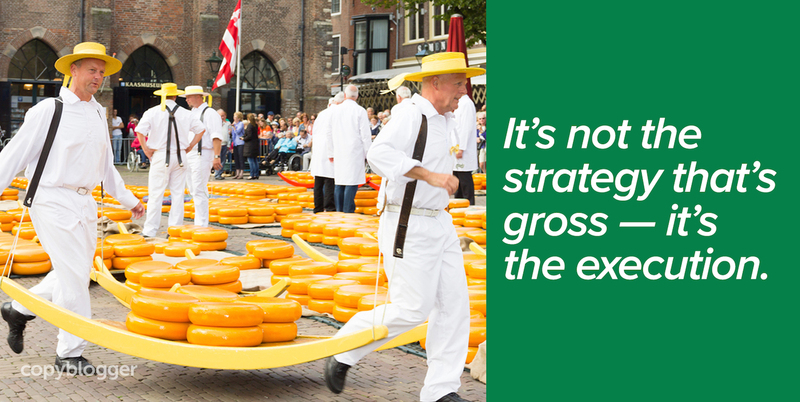 It’s not the strategy that’s cheesy. It’s the execution. Quizzes can be inane and fluffy, or they can be well-thought-out, branched content that lets you respond to the specific needs and preferences of that individual. Story-based content can be rambling and shallow, or it can be well written and insightful. Some customers like Velveeta and some like Asiago. Find out. Then serve what your particular people are hungry for. If traditional aggressive selling makes you feel a little bit … cheesed, we have something coming up that you might like. We’re partnering with a masterful salesperson who has a pressure-free, low-cheese approach to selling that could be right up your alley — and help those of you for whom selling feels uncomfortable or even impossible. I should have more details for you next week. Until then, stay cheesy, my friends! Sonia loving this post! It ain’t the sell; it’s the energy behind the approach. Sell with fear and you scare off folks. Whether a weak sell, unclear sell or desperate push. Sell with love and harmony, and no matter the approach you will earn coin. I recently began linking in to one of my eBooks via comments. Felt great about it. Plus it is a blog link. Instant uptick in sales. I had to get clear on the approach but goodness it feels fun to help folks, to make money and to live the dream. Get clear guys. Of course, when you’re selling from love and service you’d never be pushy or stray from the truth. Signing off from the South Island of New Zealand. Yah. It is a pretty gray line between click-bait and a headline. Everyone has had countless interactions with sales pitches, whether it’s on TV, face to face, or in a click add. I think most marketers have a very easy time justifying to themselves that something is authentic. So, it’s really not about convincing yourself; that’s easy. It’s about convincing others that your one liner is real. That if they click on this link, they will get what you tell them they will get. I think this comes down to authenticity versus being manipulative. And most people can tell if you are being manipulative. Being manipulated by a sales person, or a click bait add, is a terrible feeling. You are thinking, “I really wanted to learn the 10 best foods to eat to lose wait. Man, was I dumb to think that I was actually going to get some content out of this click.” In my opinion, a lead generated in this manner, is not going to be a good lead. In short, make sure your message is going to come across as genuine and not manipulative. Even if you aren’t trying to be manipulative, it matters how your potential customer perceives it, not how you justify it. All writing is telepathy. Stephen King told me that. He writes it, I read it in a different time and place, I know what he was thinking. However, if we literally start telepathically transmitting stuff, I’m out of a job. If I have to start busking with this guitar, people will pay me to stop. hehe, orange hat.. funny.. thanks for good read! I really like the term “orange hat”. It has a nice ring to it. I think a lot of marketers just lose sight of the “human” element when they are writing something. Especially when it comes to those that are used to SEO; the think about the keywords and the CTA, but they don’t think about the fact that they are going to be communicating with a human. Cheesy marketing can build a strong connection between the writer and the reader when done right. Some of the cheesier sales tactics I have seen remind me of Dad jokes. They aren’t funny but normally always get a chuckle (or a huff), if only at the person telling it. But nevertheless, sometimes they are needed to break a stagnant point in conversation or to release a tense mood. While I typically steer clear of the aggressive selling techniques, I believe there needs to be points in any sales strategy that are a bit more forward and some less so. A perfect balance for the desired audience is ideal, but how to find the perfect balance? Testing of course. Surely there is a happy medium between aggressive and too soft. As they say trends go around, and while a cheesy line or sales tactic may not work this time around who is to say it won’t work next week?